PISCATAWAY, N.J., Oct. 18 /CSRwire/ - Crumbling infrastructure has reached crisis proportions across the globe, with the U.S. Department of Transportation’s (USDOT) Federal Highway Administration (FHWA) estimating that $170 billion in capital investment will be needed each year to improve conditions of the nation’s 3.9 million miles of highways and 140,000 rail miles. 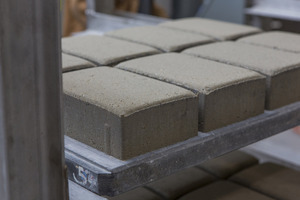 To help decrease emissions and drive economic growth, the FHWA supports the development of alternative materials, as shown through a multi-year Cooperative Agreement (CRADA) with Solidia Technologies® to examine transportation infrastructure applications for its CO2-cured concrete products. Independent tests conducted at the Turner-Fairbank Highway Research Center (TFHRC) have demonstrated the superior durability and strength of Solidia Concrete™ products that, combined with sustainable Solidia Cement™, reduce the carbon footprint of cement and concrete up to 70% and can save up to two trillion liters of water per year. Smooth roadways cause less stress on vehicles’ tires and shock absorbers, increasing fuel efficiency and vehicle longevity. The production of cement, which is used to make concrete, is responsible for 3-5% of total global carbon emissions. As the carbon economy is coming online, asphalt and concrete manufacturers seek alternative cementitious materials, as traditional products add to greenhouse gas emissions. Solidia Technologies provides the infrastructure sector with solutions to a wide variety of applications by enabling producers of cement and concrete to consume CO2 and profitably manufacture materials that are not only stronger, but also more energy- and resource-efficient. Scientists from Solidia joined other leaders in infrastructure materials gathered recently for USDOT’s Third Bi-Annual Workshop on Emerging Developments Related to Alkali-Aggregate-Reaction (AAR) and the Use of Alternative Cementitious Materials (ACMs) in Highway Infrastructure. Presenting “Performance of Carbonated Concrete,” Solidia’s Principal Scientist Sada Sahu, Ph.D., reported that Solidia Cement, a low-lime calcium silicate cement (CSC) that uses CaCO3 and SiO2 as its reactive products, emits 30% less CO2 during the production process compared to ordinary Portland cement (OPC). Solidia’s systems can consume up to 300 kg of CO2 per ton of cement during the concrete curing process, resulting in up to 70% reduction in CO2 emissions combined. “Finished Solidia Concrete products can contain up to 7 wt% of sequestered CO2, although it is subject to the particular application. Solidia uses carbonation instead of hydration, so we are not only reducing CO2 in the atmosphere by sequestering in concrete products, but we are also able to recycle and save water used in the process,” explained Dr. Sahu. If the worldwide cement and concrete industry were to adopt Solidia’s technologies, it would save two trillion liters of water per year. Research also shows that Solidia Concrete has high resistance to salt spray used for de-icing roads and better abrasion resistance, resulting in enhanced durability. Dr. Sahu was joined by research partner Jason Weiss, Ph.D., professor of civil engineering at Oregon State University who presented a paper entitled, "The Role of Alternative Cements in Limiting Joint Damage Due to Calcium Oxychloride.” Dr. Weiss reported test results demonstrating the superior performance of Solidia Cement-based concrete in freeze thaw environments with de-icing salts. “Solidia Cement and Concrete address pressing concerns facing the cement and concrete industry and the world at large,” said Dr. Sahu. The Turner-Fairbank research and other independent tests show that Solidia Concrete is stronger, more durable, more flexible and costs less than traditional concrete products, all while using the same raw materials and equipment, but less water, energy, and time throughout the entire supply chain. Curing in less than 24 hours, Solidia Concrete speeds up project development by offering a dramatic time savings over traditional concrete, which requires up to 28 days to reach maximum strength. In July, Solidia was awarded U.S. Patent No. 9,393,715, "Composite Railroad Ties and Methods of Production and Uses Thereof," which covers railroad ties (RRTs) manufactured from novel composite materials. Possessing physical and performance characteristics matching or exceeding traditional concrete, Solidia Concrete RRTs can be readily produced from widely available, low-cost raw materials by a process suitable for large-scale production with improved energy consumption, a more desirable carbon footprint and minimal environmental impact. Solidia’s IP portfolio includes over 200 patent applications worldwide, with 31 issued patents and 15 scheduled-to-be-issued within the next few months. Solidia Technologies® is a cement and concrete technology company that makes it easy and profitable to use CO2 to create superior and sustainable building materials. Based in Piscataway, N.J. (USA), Solidia’s investors include Kleiner Perkins Caufield & Byers, Bright Capital, BASF, BP, LafargeHolcim, Total Energy Ventures, Bill Joy and other private investors. Honors include: 2016 Sustainia100, 2015 NJBiz Business of the Year; 2014 Global Cleantech 100; 2013 R&D Top 100; 2014 Best Place to Work in NJ; 2014 CCEMC Grand Challenge First Round finalist; 2013 Katerva Award finalist; and MIT’s Climate CoLab shortlist. Follow Solidia Technologies at www.solidiatech.com and on LinkedIn, YouTube and Twitter: @SolidiaCO2.